for Sunday's 55th Daytona 500. Gordon's daughter Ella stands with both drivers. NASCAR's top 3 series hit the ground running this week at Daytona International Speedway. 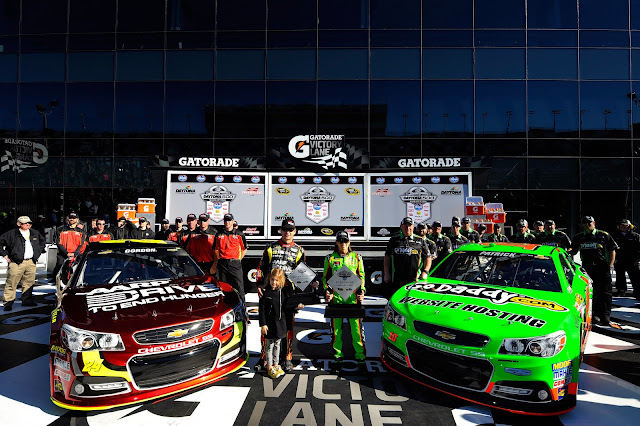 The Camping World Truck Series, Nationwide Series and Sprint Cup Series open the 2013 season. After the non-points Sprint Unlimited last week, the Sprint Cup drivers gear up for the series' biggest race of the year, the Daytona 500. With a historic pole winner and a new racecar, all bets are off. The following is a handy guide to track events and TV coverage at Daytona during the second week of Speedweeks. All times are in Eastern Standard Time. 2 p.m. NSCS: Budweiser Duel 1, SPEED. Green flag, 2:19 p.m.
7:30 p.m. NCWTS: NextEra Energy Resources 250, SPEED. Green flag: 7:52 p.m.
1:15 p.m. NNS: DRIVE4COPD 300, ESPN. Green flag: 1:34 p.m.
1 p.m. NSCS: Daytona 500, FOX. Green flag: 1:30 p.m.